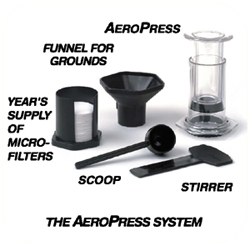 The Aerobie® Aeropress™ is a unique coffee brewing system. It is the device pictured here, not including the glass mug. A plunger type device is used to brew a fast, mellow cup of coffee. This may seem like a strange question, but the AeroPress is a unique item, so it is an important question. The AeroPress is NOT a press pot or French pot. You do not let the coffee brew in the hot water for a prolonged length of time. The coffee and water are only in contact for less than 30 seconds. The output is a concentrated, full flavor, minimal acid brew. Think of it this way, the first 10 to 15 seconds work like a press pot (i.e. : ground coffee mixed with hot water) then the next 20 seconds it works like an espresso machine (i.e. : hot water under high pressure forced through coffee grounds). The AeroPress system (duh) and a heat source, coffee, water, and optionally sugar. Since the water temperature is critical, an instant read thermometer is helpful, at least until you learn how to get the water optimal. A coffee mug is an integral part of the system, and you need to supply one, too. A glass mug allows you to see what is happening a bit more ... but as long as it tastes good, it doesn't matter! If making a single serving, then espresso grind is best. If making several servings, you should use a drip grind. There are many variables when using an AeroPress and experimentation is a key part of getting it right for your personal tastes. The AeroPress gives you a tremendous amount of control over how your coffee turns out. It can make from one to four servings per press (brewing). The manufacturer recommends using water that is between 165 and 175 degrees F., different than other methods use. Water temperature is vital. Doing it correctly, you can make what many say is the perfect cup of coffee. One way to do this is to boil the water and use an instant read thermometer from any kitchen store. Once you remove the water from the heat, see how long it takes to reach 175 degrees. In some places, your water may boil at the proper temperature (higher elevations). Do not allow the water to boil more than a couple of seconds. Once you know the timing, you are all set for the future. Place your ground coffee into the chamber. Use one included scoop per cup of espresso or per cup of coffee wanted, to a maximum of four scoops. Now heat the water. You can actually heat it in the plunger, since it is hollow, or heat it any other way desired. The manufacturer recommends 165 - 175 degrees F. (75 - 80 C). First, wet the grounds with the water slowly, then add the rest of the water. There are markings on the chamber as well as the plunger for how much water to use. Stir gently for about ten seconds. Wet the rubber seal on the plunger, insert it into the chamber and press slowly, it should take about 20 seconds for all the water to pass through the grounds, depending on how much you are making. You now have what the manufacturer refers to as "espresso" in your cup. This is arguable, but the fact is that you have a very smooth, concentrated form of coffee. If you are after a more "classic" cup of coffee, you can add hot water to the output of the Aeropress, diluting it with 2 to 3 times the amount of hot water to espresso. DO NOT try to push more water through the grounds than recommended, you will not get a better cup, just a more bitter and acidic cup. Yes, "Aerobie" as in that frisbee thingy that we all love to play with. Same company, different product. Their first foray into coffee, and it is a winner.